• Acrodisc PSF syringe filters are Zymark* and SOTAX* Automation Certified to assure smooth operation and worry-free performance 24 hours a day in automated workstations. • Ideal for filtration of gas and/or organic solvents. • Prevents spurious peaks on chromatograms for accurate experimental results. HPLC certified for low levels of UV-absorbing extractables. 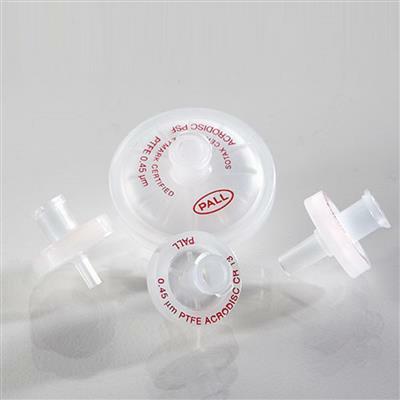 • Prevents "air bubble" lock when filling sample vials with 13 mm minispike outlet. • 4 mm device offers the lowest sample hold-up (< 10 μL) and is useful for samples up to 2 mL in volume. • Ultimate in chemical compatibility for filtering harsh chemicals that destroy other membrane materials. • The Acrodisc PSF GxF syringe filter provides two to four times the throughput of standard prefilter devices. • Moisture barrier for venting applications. • 25 mm Acrodisc PSF syringe filter is available in robotic-compatible AutoPack™ packaging for SOTAX AT-70 SMART* and CTS and Zymark TPW*, APW*, and MultiDoses dissolution systems.